The headteacher of an under-threat school has spoken out ahead of a meeting of South Tyneside Council’s cabinet which will decide its fate. The future of South Shields School has been undertain since the Regional Schools Commissioner was unable to find a sponsor in order for it to become an academy. It’s bitterly disappointing that improvements of more than 20% in results in core subjects such as English, Maths and Science appear to be worthless in encouraging anyone to reconsider the consultation process we find ourselves in. The move to take it out of local authority control was triggered after it received an ‘inadequate’ rating by Ofsted. 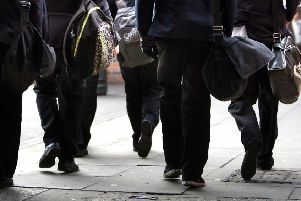 It is understood the failure to find a sponsor was largely due to falling pupil numbers which has had an impact on the longer term financial viability of the school. The council’s cabinet were due to meet tonight where a decision is due to be made on the launch of a consultation process into the future of the school. If given the go-ahead, the process could start next Thursday. In a statement yesterday, head teacher Allie Denholm praised staff and the recent GCSE results achieved by pupils. She said: “There is an incredible team of dedicated staff at South Shields School who have worked tirelessly in the last three years to identify, address and correct the long-term and historical issues at the school. “Our most recent GCSE results are a clear indication that measures being put in place are allowing us all – most importantly the pupils – to make hugely positive steps in the right direction. “It’s bitterly disappointing that improvements of more than 20% in results in core subjects such as English, Maths and Science appear to be worthless in encouraging anyone to reconsider the consultation process we find ourselves in. “We are operating under a legacy of historic underachievement that has clouded perceptions. Our school’s many achievements in more recent times are going unrecognised because of this. She added: “We’ve recruited and retained high quality staff that have understood the challenges and responded as a unified team. They remain determined to continue to make improvements for the benefit of the pupils and are extremely committed to continuing to provide highly effective teaching and learning across all subjects. A dedicated telephone number has been put in place for parents and carers wanting more information, call 424 7847.